The CyberConnect2 Co., the company responsible for the series, nailed to develop Naruto Ultimate Ninja Storm 4 exclusively for the new generation of consoles. During our tests we enjoyed a visual cel shading full of minute details. The demo managed to portray very well the mood of the anime, giving the feeling of being a real playable version of the drawing. 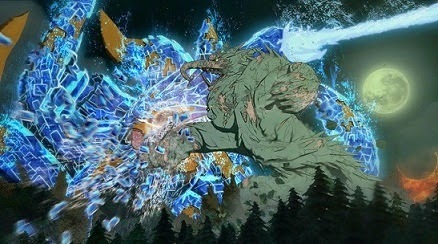 The many particles bouncing the screen during the Jutsu of the ninja also caught our attention. The lighting effects overflowed whim, with explosions Chakras parading vivid and bright colors scenarios known by the fans. The facial expressions of the characters also gained prominence in this new version, as Madara ferocity traits, for example. In the build attend the event, we had the opportunity to relive the iconic battle between Hashirama Senju and Madara Uchiha, one of the most important of Naruto's plot. The essence of Ninja Storm series remained untouched. This means that the combat dynamic is the same, but there are new mechanics such as the ability to dodge blows virtually indefensible. In addition, weapons and other accessories sprout during the clashes to generate new possibilities of attack. The camera system has also been enhanced to make the experience even more faithful to the anime. During the execution of certain combos and special powers, the focus shifts dramatically, making the film more action. The possibility of fighting giant creatures with a minor character has just enough diversifying the dynamics of struggle. During gameplay, we had the opportunity to invoke the addition a colossal golem to help us against a cunning fox nine tails led by Madara. Apparently, the Giants can considerably prolong the duration of conflicts. The scenarios can also vary during the clashes, giving more dynamism to epic encounters. In each room you will need to adopt different strategies, since the type of location directly affects the movement of the character and, consequently, in the implementation of successful Jutsus. As might be expected, Naruto Ultimate Ninja Storm 4 will explore the last appearances of the iconic characters of the manga. There are rumors that some characters in the film, as versions of Hinata, Shikamaru and Temari also deem faces. The game should arrive sometime in 2015. It is too early to stake any opinion on Naruto Ultimate Ninja Storm 4, but from what we saw in the matches of the first build, the CyberConnect2 Co. proved to be committed to strengthen the dynamism of the fighting. So far, Ninja Storm is visually stunning and entertaining. The new game can be a breath of fresh air for fans of the series that urgently need to breathe a promising and most ambitious game. Unfortunately, what we have left is to wait.